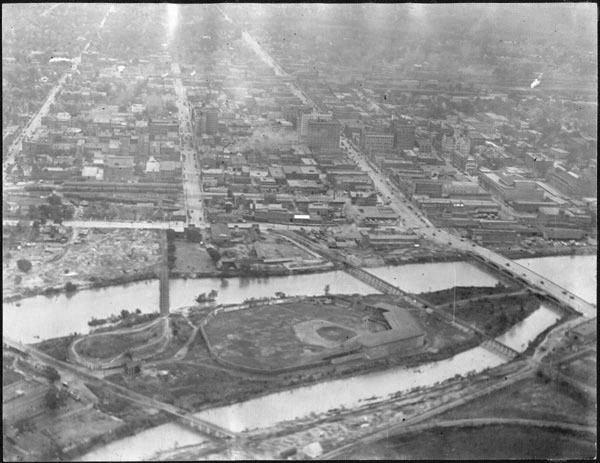 Description: Aerial view of downtown Wichita looking east, showing Island Park baseball stadium and Wonderland amusement park on Ackerman Island in Arkansas River. Keywords: Wichita, aerials, rivers, business and industry, bridges, street scenes, parks, sports and recreation, Arkansas River, baseball, stadium, Ackerman Island, roller coaster, Wonderland amusement park. 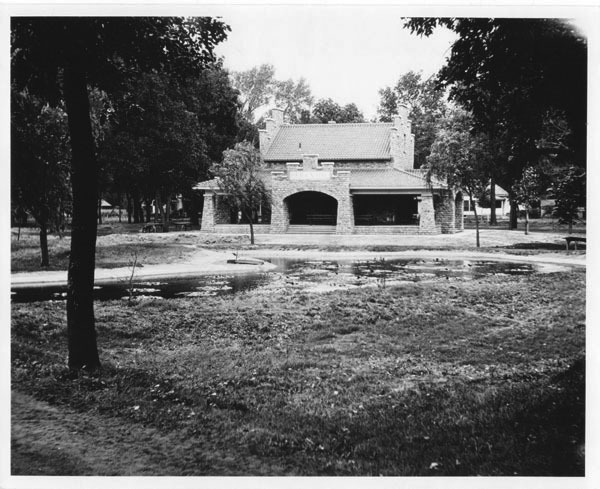 Description: Park Villa shelter house in North Riverside Park, near Little Arkansas River and Nims Avenue bridge. 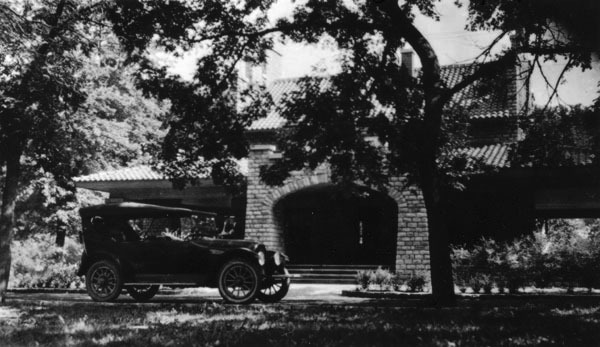 Keywords: Sports and recreation, parks, automobiles, transportation, Wichita. Description: Riverside Park Bird House and Sanctuary. 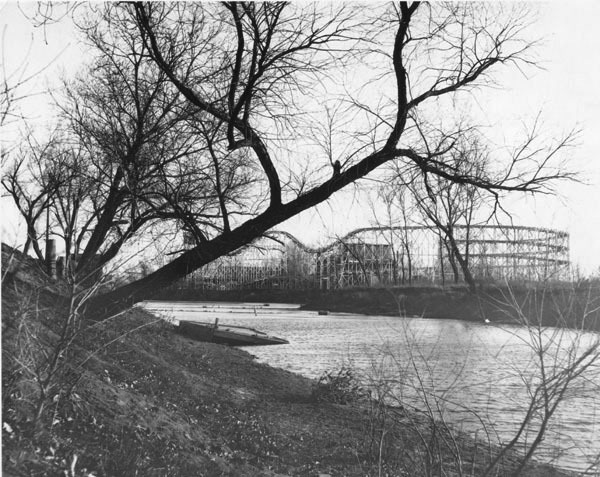 Riverside Park was located at the west end of Murdock. 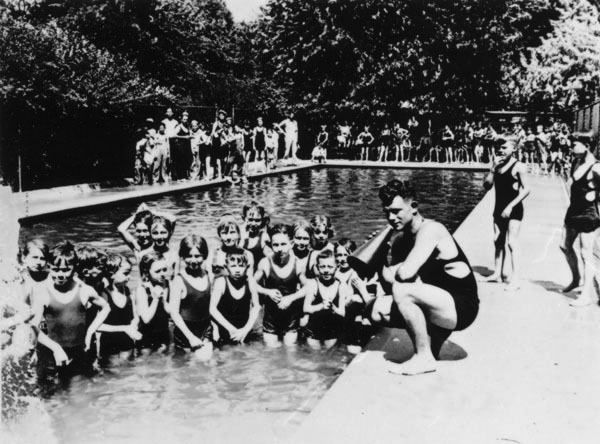 Description: Group of young swimmers with coach at unidentified swimming pool. 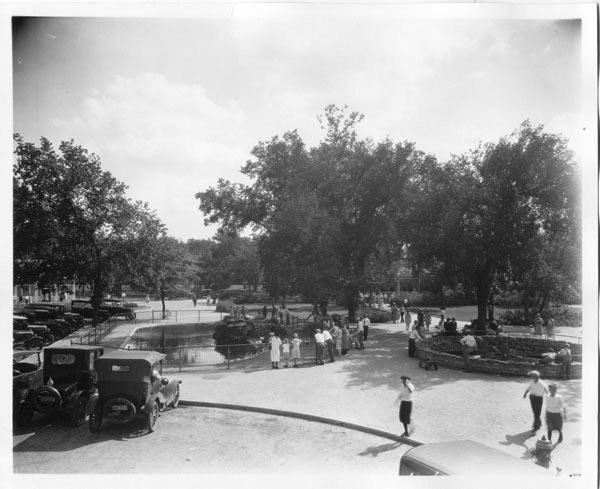 Keywords: Sports and recreation, children, parks, summer, Wichita. Description: Looking east across the Little Arkansas River at the Riverside Boathouse (known earlier as Israel's Boathouse and Murdock Avenue Boathouse). 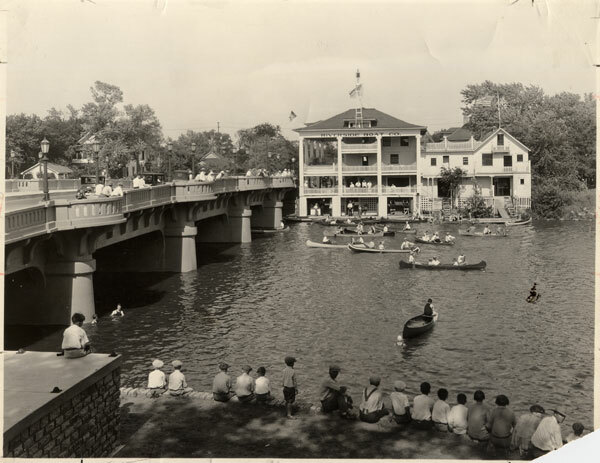 Founded near the intersection of Murdock and Waco, in the late 1890s, the boat rental business and its original small structure, grew in size and commercial enterprise for more than 50 years. 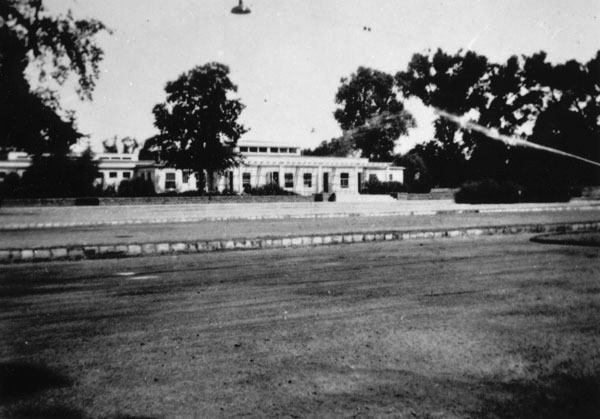 It was demolished during the "urban renewal" efforts of the 1960s. Keywords: Wichita, bridges, business and industry, parks, people, public events, rivers, sports and recreation, transportation, canoes, boating, swimming. 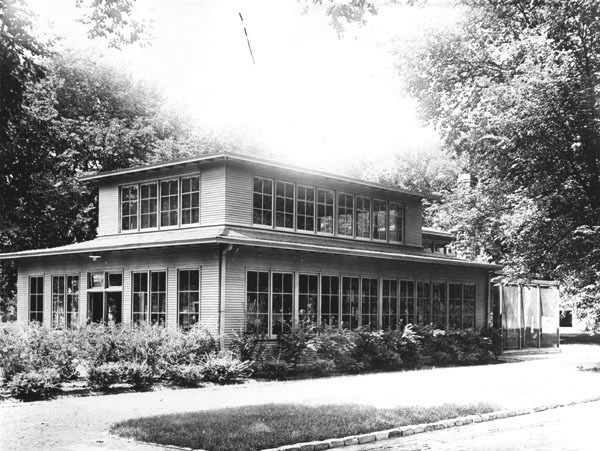 Description: View of exterior of bathhouse at the Municipal Pool in South Riverside Park. 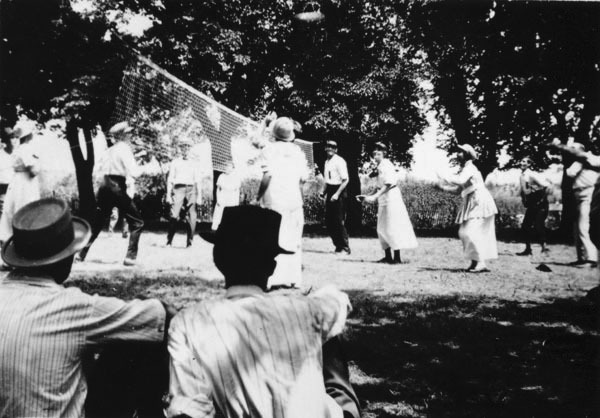 Keywords: Sports and recreation, parks, Wichita.